Diese beliebte Privattour trifft alle Top-Attraktionen von Quito. Folgen Sie Ihrem erfahrenen Guide durch den historischen Stadtteil der Hauptstadt, stellen Sie sich auf den Äquator und fahren Sie mit der höchsten Gondel Südamerikas. 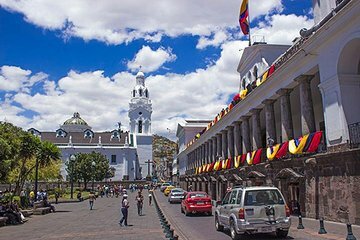 Diese ganztägige Erfahrung ist ideal für Reisende, die Einblick in die Geschichte und Kultur von Quito erhalten möchten. This was a terrific tour and our guide Juan was excellent. He was very friendly, and knowledgeable. We went to a fantastic seafood restaurant for lunch and since it just my husband and myself on the tour we bought Juan lunch, which he never acknowledged. The only negative in an otherwise great day. Our guide Juan was terrific, the tour was very well organised, interesting, and very comprehensive. Great guide (Ana), great driver. Lots of information and lots of fun. Unfortunately the Gondola was shut down for maintenance but they found us great alternatives. Beautiful day all over Quito. Luis of Lead Adventures was the best! He was very detailed in explaining about his city and country. He kept us safe. He helped me get the wonderful photos I collect. We enjoyed our full day with Luis. The tour company never showed up. We spent the day simply walking around. Very disappointed on this one. Do it your self specially if you are staying in downtown Quito. Our tour guide was amazingly informative... we were both impressed. The tour was incredibly thorough and included all major points in the Quito that we wanted to see and learn about. I could honestly and easily recommend this tour to anyone. This was a fantastic tour. Our tour guide, Dario Morales, was awesome. We had my 74 year old father with us and he was very sensitive, going very slowly and talking right to him. The Gondola ride was great, we were blessed with clear, awesome weather! It is a great tour to introduce you to the city. We were very lucky to have Louise as our tour guide, he is so knowledgeable, so helpful and very friendly, one of the best.